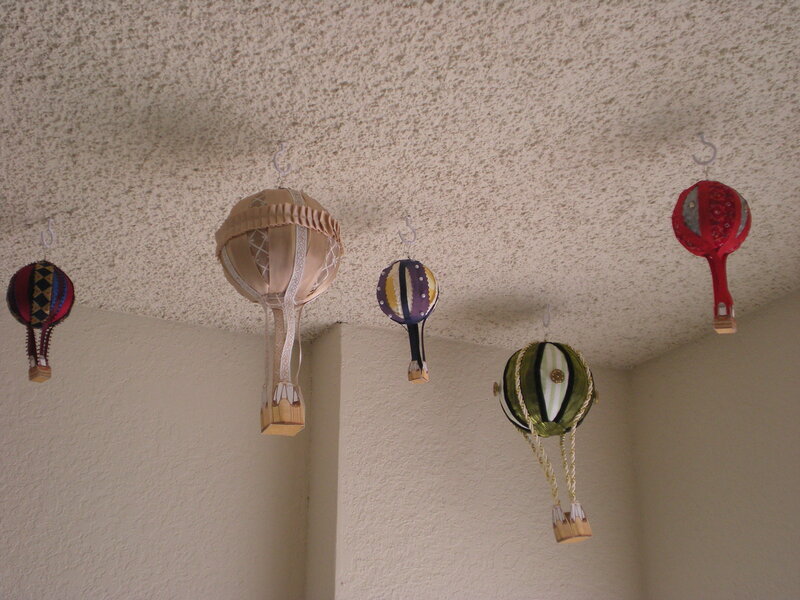 My hot air balloons are now installed in the ceiling of my sewing room. (See my previous post here for more construction details). Originally I planned to put them in my bathroom but when my husband was about to start drilling holes in the ceiling he realized there was a lot of electrical wiring in the place where I wanted to hang the balloons. Oh well, change of plans! Putting balloons in my sewing room throws a slight wrench into my plans to redecorate my bathroom with a Jules-Verne theme. I wanted airships, submarines and other things inspired by 20,000 Leagues Under the Sea and Around the World in 80 Days. I’ve been posting ideas on my Pinterest board but it looks like I will have to figure out another way to do hot air balloons without ceiling holes. Posted in Uncategorized and tagged crafts, hot air balloons. Bookmark the permalink.